While in Asheville, North Carolina in the spring, I interviewed architects and married couple, Tom and Yumiko Virant of Virant Design. I first saw pictures of their modern home (recently sold) posted on the Modern Asheville site, which were beautifully photographed by David Dietrich, and wanted to meet the savvy duo behind this truly stunning home. 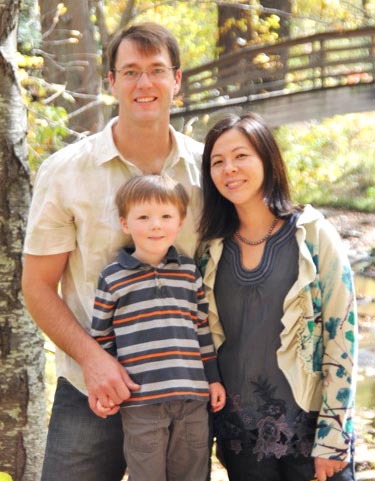 I soon learned that Tom and Yumiko met studying architecture at Virginia Tech. They moved to Chicago after grad school and while Yumiko worked for a small but detailed architectural firm, Tom worked for various firms and took this time to delve into construction. In their work relationship, this divergent experience appears to balance them beautifully. As Tom explains, "I would not question her schematic design abilities and she doesn't tell me how things are built." Tom and Yumiko are part of the Design/Build movement. Their mentors are Jersey Devil, a Design/Build collaborative that started in the early 70's. It's a back to the land mentality as these architects and craftspeople believe in designing and building their homes or structures while also maintaining a strong environmental conscience. The founding members of Jersey Devil helped define exactly what Design/Builds are from an architect's perspective. This approach certainly has its advantages. As Tom explains, "It's a package deal. We tend to build what we design and we design what we build, not to mention we can do unusual and custom details because the architects are the ones swinging the hammers." When designing a home, I love how Yumiko explains what she most wants to hear from a client, "I want them to tell me how they want their space to feel, as opposed to how they want it to look." Yumiko loves how this home feels cozy and big at the same time and also has a flow. She adds, "It never feels crowded and always feels like exactly the right size." The home, which her and Tom completely gutted and then rebuilt on the same foundation, is 2100 square feet with 800 square feet in decking. The Virant design aesthetic is modern, clean and Japanese influenced. Yumiko's family is from Japan and she spent her summers there as a child. She shares how in Japan everything has a design aesthetic, for whether it's packaging for food, road signage or toys, how something is presented is always thoughtfully considered. She continues to be attracted to pretty things and quiet spaces. One of my favorite features in modern homes like this one are the windows. Tom taught me a new word, as the long narrow windows atop a high wall are referred to as a clarestory. Allowing in much natural light, these windows fulfill a function as well as being aesthetically pleasing. Tom makes a good point, "If you design and build something that is attractive, people will be more likely to maintain it properly." Their work is certainly beautifully designed and maintained and offers endless inspiration. I look forward to sharing more homes designed and built by Virant Design in some upcoming posts. Thank you Tom and Yumiko! For more details on this modern home renovation, click here.